Lounging in the cafeteria of the Michael Woods training complex in Glenrothes on Thursday morning, chatting to the press and sipping coffee, Ray McKinnon did not strike you as a manager dealing with speculation over his future while in the midst of pressure play-off games. With a second consecutive Championship manager of the month award by his side, the Raith Rovers boss could not have appeared more relaxed if he stuck shades on and pulled out a deck chair as he reflected on the magnificent 1-0 win over Hibernian in the quarter-final first leg at Stark’s Park the previous night. He spoke openly about the upcoming second leg tie, the prospect of winning promotion, and about speculation linking him with Dundee United following the sacking of Mixu Paatelainen. Pressure? What pressure? McKinnon is just taking everything in his stride, and his nature is reflected in his team, who are now unbeaten in 12 games, and giving him everything they’ve got. Indeed, such is the level of focus within the Rovers dressing room that this week’s headlines over the manager’s future have not even been a topic of discussion. “I’ve not spoken to the players about it at all,” McKinnon said. “We came in last night and, in the lead-up to the game, not one of my players broached it. “That’s purely because they’re so focused, which is something we’ve really drilled into them recently. They stay focused. For now, McKinnon’s full attention is on completing what would be a fairytale season by taking the unfancied Kirkcaldy club up into the Premiership. But with United believed to have identified the 45-year-old as their number one candidate, there are questions over whether he will remain at Stark’s Park once the play-offs are over. “If I take Raith up, I will be the Raith Rovers manager next season - it is as simple as that,” he told the STV cameras. Words that should provide extra motivation for his players. If Raith don’t go up, however, the chance to manage a bigger club, albeit with big problems, and his connections to Tannadice would make any offer hard to turn down. “I can say openly that I have ambition and I want to go as far as I can in football,” he said. “I’ve got the drive and I’m hungry for it, but what will be, will be. I can’t affect the future. “All I can do is focus on the task in hand and try to do my best for Raith Rovers. “Make no mistake about it, they’re a big club. Any time you’re linked with a club, it’s exciting. “It’s my home town club, I played for them, my kids support them. I get that. After masterminding a first leg victory over Hibs on Wednesday, McKinnon intends to stick to the game plan when he leads his players to Easter Road for the Saturday lunchtime second leg. “I think we approach Saturday the same way we intended to prior to winning the first leg,” he said. “We had a strategy before the first leg and we’ll probably stick to it. “The result doesn’t affect how we’re going to set up at Easter Road. I’m not going to say it in the press so Stubbsy can read it – but we have a plan! To progress, Hibs now need to become the first side other than Rangers to beat Raith since January, and by a two-goal margin – the pressure is certainly on the Edinburgh club. “I think it makes life very nervous for Hibs,” McKinnon said. “There isn’t any doubt about that. “They are a massive club, they won’t want to spend another season in this league. That is the reality of it. “For us, this is a bonus. All we have to do is go out and try our best. “The pressure is on them in the second leg. They have to come and attack us, which might leave them open. “You don’t know how pressure is going to affect their players. McKinnon is a friend of opposition manager Alan Stubbs. “I did all my badges with Stubbsy, my Pro Licence, and had a few nights out with him. He’s a good lad,” he said. However, he felt that the Hibs boss was looking for excuses with his remarks after Wednesday’s first leg where he blamed the state of the Stark’s Park pitch, and the match officials for failing to award his side what was generally perceived as soft penalty claims. “For me, that’s pressure,” McKinnon said. “I never see Stubbsy like that and I know him really well and get on great with him. That is pressure, blaming everything apart from not getting a result. “I accept that and when he woke up this morning he probably thought twice about blaming this and blaming that. “It was the same for us. I thought the referee didn’t give us some decisions - it’s part and parcel of football. “There’s pressure attached to what he’s doing and how he handles it is important to him. “There’s no pressure on me. I had a couple of tea with me on the bench and cruised through that game. “I can just see there’s pressure on them. I can see their bench, it was animated and they were calling for everything, chasing everything, chasing down the fourth official. 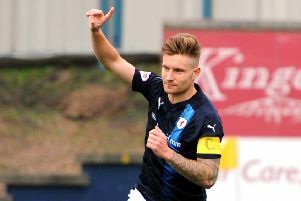 With potentially five more games to negotiate, promotion to the Premiership remains a long way off, but if the dream became reality, McKinnon believes big changes would be required at Stark’s Park. “If we do get to the Premiership there’s got to be a lot of change, a lot of investment,” he said.